On December 19, 2012, in Kentucky, Gary L. Foster, Jr. was indicted for second-degree animal cruelty after he allegedly broke a kitten’s front legs with a golf club. ALDF’s rankings of all 50 states for the 2012 report (click on image for larger size). Two days before Foster was indicted, the Animal Legal Defense Fund released its annual U.S. Protection Laws Rankings, a report that ranks all states in the U.S. in terms of animal protection laws. 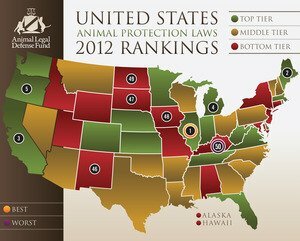 The 2012 edition ranks Kentucky 50th — the weakest for animal protection — for the third year in a row. In contrast, Illinois was ranked the best state for animal protection laws for the fourth year in a row, and all states in the “Best Five” have animal abuser registries. The top (and bottom) five states in the “Best” and “Worst” categories remain relatively unchanged from 2011, with the exception of Idaho. In 2012, the Gem State moved out of the “Worst Five” to 44th overall, and was called the “most-improved jurisdiction.” As the Gem State moved up, New Mexico fell, and now rounds out the bottom-five ranked states. One notable new category implemented in the 2012 study is a state’s “ag gag” laws — laws that make it illegal to take photographs or video footage at agricultural facilities. Iowa, Kansas, Montana, North Dakota, and Utah are all the states that have such laws. “We look forward to further progress in the upcoming year,” Stephen Wells, executive director for ALDF, says. “Regardless of ranking, each state and territory has ample room for improvement. The ALDF report is based on each state’s existing laws and does not take into account the conduct of its animal rescue groups and organizations or the conditions of its shelters.